Flagstaff, AZ – Today, Lt Col (ret.) Wendy Rogers announced robust fundraising results for the first quarter of 2016. In the 78 days since entering the race, Col Rogers has raised over $144,000 from a diverse and widespread base of supporters. Rogers, who draws from her prior campaign experience and fundraising prowess, was quick to raise a war chest to compete with her rivals in the race to win Arizona’s 1st congressional district. “I am extremely grateful to my supporters who have entrusted me with their confidence and financial commitments. This race is about restoring a culture of service through conservative proven leadership and I pledge to honor that commitment,” Rogers said. Rogers is also balancing her fundraising efforts against personally meeting hundreds of voters on a daily basis. Following a strict schedule, Col Rogers spends a portion of her day on the phone raising money before heading into the field on her bicycle to visit with as many voters before the sun sets. To date, she has knocked on almost 5,000 doors in the district. Lt Col (ret) Wendy Rogers and her husband Hal are both retired career US Air Force officers. Since 1997, they’ve owned a home inspection business covering four counties spanning northern to southern Arizona. 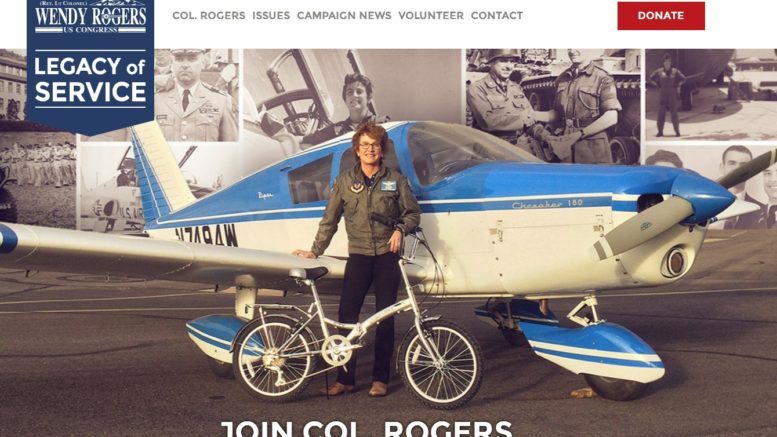 Col Rogers is a businesswoman, teacher, social worker and grandmother. She and Hal own their retirement home in the midst of where they do business in Flagstaff, Arizona. Be the first to comment on "Wendy Rogers reports robust fundraising results for 1st quarter"